BRAC and the NYC Dept. 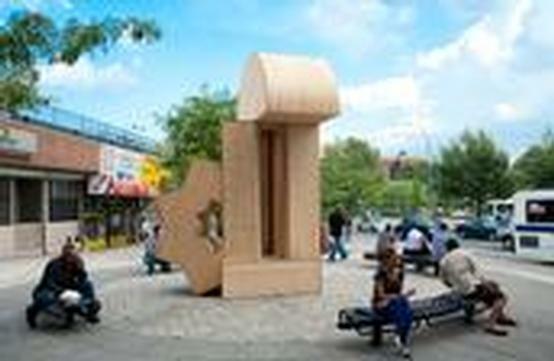 of Transportation were pleased to inaugurate Aurora - a new temporary public art sculpture by Mexican-born, NY-based artist Diego Medina in the West Farms Square neighborhood of the Bronx. 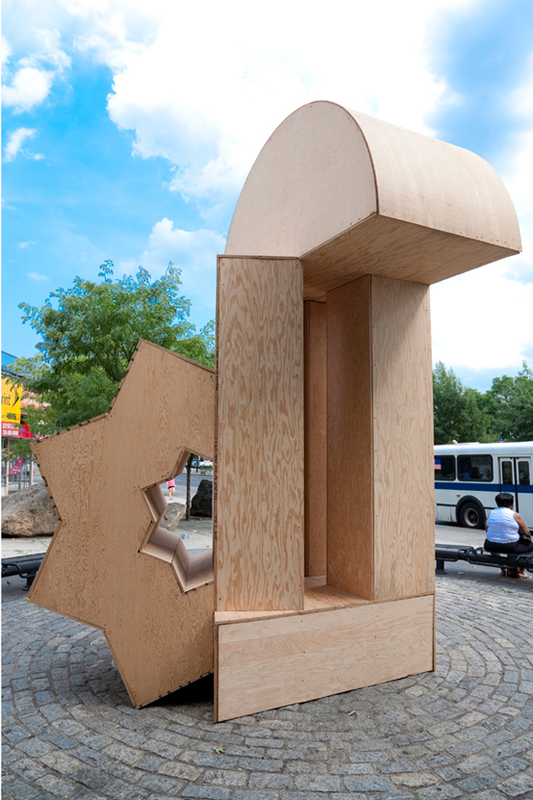 The Bronx River Art Center (BRAC) and the New York City Department of Transportation (DOT), through its Urban Art Program's pARTners initiative, were pleased to unveil a new, temporary public art sculpture by Mexican-born, New York City-based artist Diego Medina. 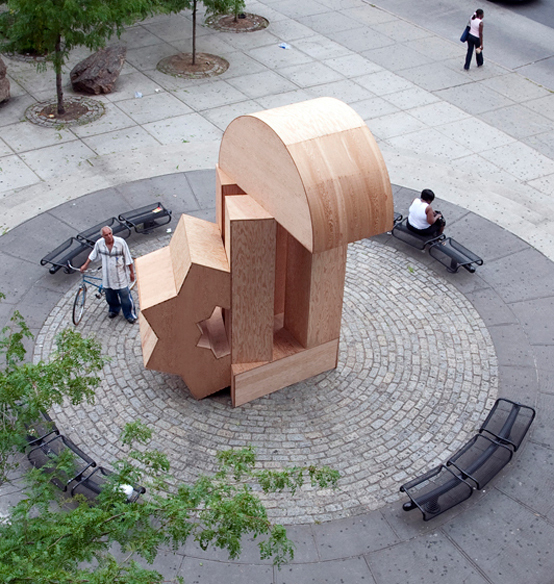 Medina's large, abstract wooden sculpture, Aurora, was on view for nearly 19 months at the center of West Farms Square Plaza — located at the base of the West Farms Square/East Tremont Ave. subway station on the corner of East Tremont Avenue and Boston Road in the Bronx, and one block away from the Bronx River Art Center. This new partnership between BRAC and DOT echoes the agency's commitment to enhancing the public realm, creating world-class spaces and strengthening community partnerships, while the addition of public art serves as a catalyst for urban renewal. The sculpture's location was deemed to be one of 14 "priority sites" selected from hundreds city-wide for beautification. BRAC also identified the same space as a location to enhance with public art. Through a Deutsche Bank Americas Foundation Arts & Enterprise Place-Based Revitalization Grant, BRAC launched the West Farms Square Renewal Committee — a consortium of local businesses and organizations to renew the public spaces that make up West Farms Square. Medina's Aurora was one of BRAC's proposals, which was selected and made possible by a grant from DOT. Aurora was constructed of marine birch plywood and consisted of six interlocking geometric shapes - such as columns, a half-star, and a half-circle - and measured 14 feet tall by 11 feet wide and 11 feet deep. Each component of the sculpture was juxtaposed to look dramatically different from each perspective. "To see this elegant and dynamic sculpture acting as a central landmark and meeting place for the West Farms Community is a strong, visual signal that things are changing for the better around here," said Gail Nathan, BRAC's Executive Director. Wendy Feuer, Assistant Commissioner of Urban Design & Art at DOT, said, "It's extremely rewarding to see this ambitious, new public art initiative come to life with the installation of Aurora. As we build on efforts to create world-class streets city-wide, we look to partner with local arts organizations with an invested interest in extending programming beyond their office walls into the neighboring community." Medina was one of three artists nominated by BRAC's Gallery Director & Curator José Ruiz to submit a proposal for a public work. “It was important not only to nominate formally dexterous artists, but also artists who conceptually interact and collaborate with the community in the same way as our Exhibitions Program of Contemporary Art," said Ruiz. Medina, an interdisciplinary artist who was originally trained as an architect and works in all media, proposed an abstract sculpture inspired by Spanish poet Federico Garcia Lorca's 1930 poem, "La Aurora de Nueva York" (Dawn in New York), which interpreted the hardships witnessed in the marginalized areas of New York City at that time. The artist offered a work that would act as the rebuttal to Lorca's poem — a work that could bear a positive attitude and a sense of hope to areas that are still marginalized. The result was a sculpture that offers endless facets when seen from many of its different perspectives, and whose sub-forms seemed precariously positioned, but which instinctively interlocked to make one cohesive form — much in the same way that the City of New York continues to alter itself organically in order to grow. Diego Medina was born in 1969 in Guadalajara, Mexico. He received his degree in Visual Art and Architecture from the Instituto Tecnologico de Estudios Superiores de Occidente (ITESO), in Guadalajara, Jalisco, Mexico. In 2004, Medina founded and served as the Director of the organization Circulo de Arte y Cultura en Nueva York. Since 1991, the artist has been the subject of over 15 solo shows and has participated in more than 30 collective exhibitions in Mexico, Cuba, Turkey, South Africa, Canada, France, and the United States. Since 2000, his efforts to promote the culture and issues of labor of the Mexican community in New York City has included directing and collaborating various cultural events for numerous Mexican organizations. Medina is also the creator of Art and Migration and Art Initiation, an ongoing series of workshops that he implements and directs for the Mexican community in New York City and the metropolitan region of Puebla and Cholula, Mexico.